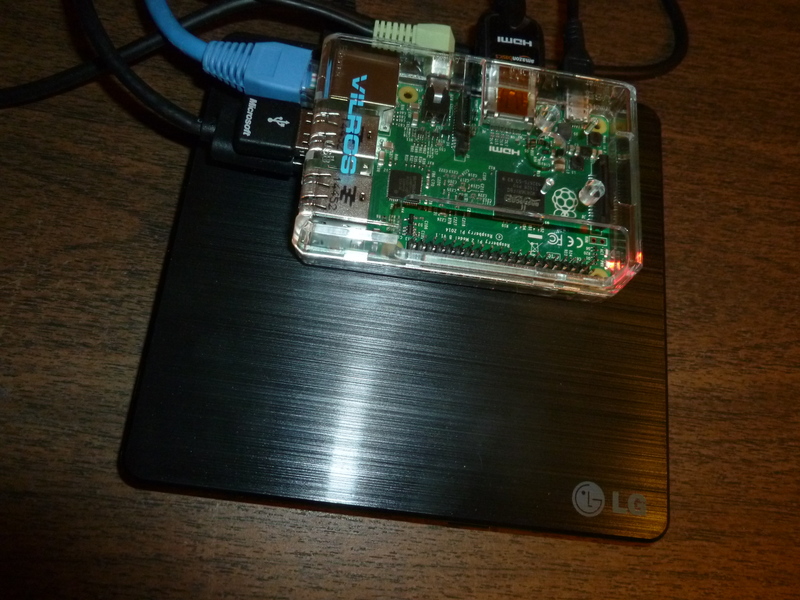 How About a Raspberry Pi 2 as a Desktop PC Replacement? I recently replaced my last remaining desktop PC with a $50 Raspberry Pi 2, a $25 USB DVD drive, and a $90 USB hard drive. So far, I’m very pleased with the results. More than ten years ago, I built a traditional desktop PC in a huge, blue case to use as my main computer. I installed Windows XP and Gentoo Linux on it in a dual-boot configuration. Besides just liking Linux, I wanted access to that OS for ripping CDs because of Sony’s rootkit kerfuffle. I very much did not want to allow music companies to infect my computer with malware. By only using Linux to rip CDs, I could avoid that trap. I still use Linux to rip CDs, not only because of the rootkit problem, but also because it gives me much greater control over how tracks get pulled from the disks. For example, it’s great to be able to rip multiple tracks that fade into each other in a single MP3 file. That way, I avoid hearing that annoying little hiccup or skip between tracks that are meant to fade smoothly into one another. The big blue PC got upgraded several times over the years, ending up as a kind of Frankenstein’s Monster of a box with four hard drives and a bunch of noisy fans. I upgraded the motherboard, processor, video card, and OS a couple of times. 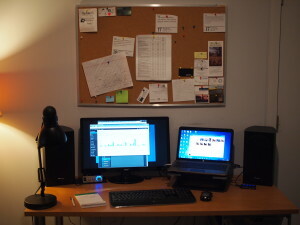 The end result was a dual-core machine last tinkered with in 2009. When the machine died a couple of weeks ago, I was tempted to replace its guts yet again, but when I thought seriously about how I used the machine anymore, I decided it was not worth spending several hundred dollars just for a CD ripper and media archive. The PC I use the most these days is a three- or four-year-old HP laptop with an external 22-inch monitor in a dual-screen configuration. It’s not the fastest computer in the world, but it’s peppy enough for what I do, which is mostly Web browsing and my writing, with a little bit of photo stuff in Picasa thrown in there once in a while. I still wanted a machine for music and movie archiving, and of course a Linux box for ripping CDs. My budget for this was limited, so for a few days I felt a bit stymied, uncertain what a good solution would look like. Then I remembered buying a Raspberry Pi Model B in mid-2014 for about $40. It was a fun gizmo, but ultimately I couldn’t find a good use for it. There are lots of RPi projects out there, none of which appealed to me. However, with my desktop PC dead, I realized I could attach a USB DVD drive to the tiny, unused computer along with a largish external hard drive and get 90% of the functionality of the old desktop at very little expense. I got a $90 2TB USB drive from Costco, hooked it up to my Lovely Spouse’s desktop, and one-by-one connected the old drives from the old PC to her machine and copied all my music, movies, and documents over to the external drive. Then I got an LG USB DVD drive from Amazon and connected everything up to the RPi. It worked great and was fun, but in terms of performance, it was like going back in time ten or fifteen years. For example, I ripped a dozen or so discs as a test and found that it took around 30 minutes to rip a single CD. I’m too impatient for that but I was willing to live with it for a short while. A few days after setting up this test rig and while researching ways of speeding up the Raspberry Pi, I learned that there was a newer, faster model for not much money. The new model has a faster quad-core processor as opposed to the original’s single-core CPU; it also has double the RAM and more capable graphics. In tests, the 2 has three times the performance of the older one. I ordered a RPi 2, hooked it up in place of the original, and have been extremely pleased with the results. For the uses I intended, it’s a great replacement for the old PC at a fraction of the cost. Now I just need to find a fun use for the older model. I’m tempted to install an audio-oriented OS on it and a touch screen, then use it as a jukebox for my home stereo — a more flexible replacement for the iPod we’re using now. Have you had any experiences, good or bad, with tiny computers like the RPi? What’s your take on the tiny computer phenomenon? Share your thoughts in the comments! October 25, 2015 in Tech.